Track goods, identify supply chain shortages, and optimize inventory all in one place. Never have another late delivery with automatic replenishment. Set order minimums, maximums, reorder points, and lead times when the system is implemented. Clear Spider will generate orders when needed using those values. Automatic replenishment ensures you don’t miss any orders and helps to improve vendor-customer relationships. Here are just a few of the benefits our clients experience after implementing Clear Spider’s Inventory Management and Control solution. 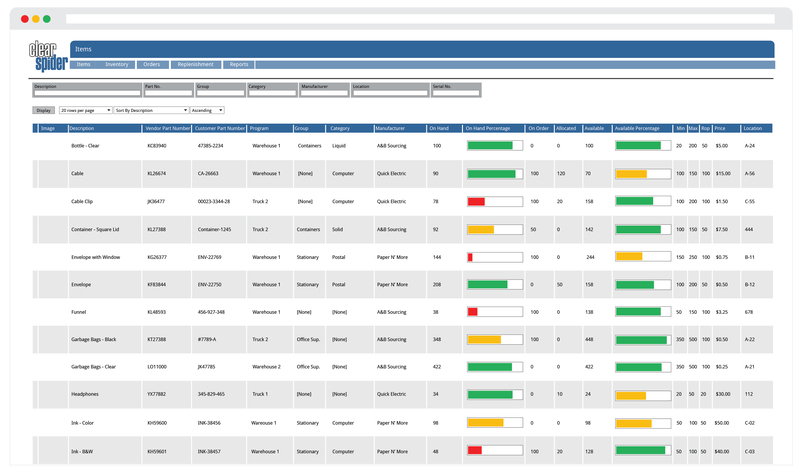 Analyzing inventory is simple with Clear Spider’s reports and analytics. You can optimize your inventory levels by tracking your current and past orders, all in one place. These insights help you streamline your operations, improve efficiency, reduce lead times, and increase inventory turnover. Avoid over or under stocking products by monitoring trends more closely. Reduce the time it takes to lookup inventory and improve customer service. Quickly look up items based on description, product number, group, manufacturer, location, or category. Full item details will then be displayed for items that match your search criteria. Having a self-serve model increases ordering efficiency by reducing and streamlining communication. Give customers access to our system so they can see what’s on hand, what’s available, what’s allocated, and place their own purchase orders. Your customer permissions can be setup according to your organization’s needs. Your can give them full access, limited access or no access to your inventory system. Giving customers any variation of access has improved our clients’ customer service levels by up to 30%. Clear Spider’s inventory management system is hosted on the cloud. You can use our software wherever you have internet access. Our team completes updates remotely so you don’t have to. There is no system delay or need to install new software. Being cloud-based also makes integrations with other systems hosted on the cloud simple. Clear Spider is a customizable system that can add or subtract functionality based on your inventory needs. Our system can be set up to mirror your organization’s workflow or unique inventory processes. Cycle counting is the process of counting small increments of inventory on a frequent basis. The Clear Spider inventory system will track and make adjustments to your stock quantities when your business performs its cycle counts. Quantities can be adjusted by scanning items or manually entering data into the system. Identify the root causes of any inventory error with frequent tracking and adjustments. Clear Spider is a highly flexible system that can integrate with almost any enterprise software on the cloud. We are able to integrate with a variety of ERP, accounting, and CRM software. Clear Spider captures every movement of inventory within the system. The system can track consumption, adjustments, cycle counts, transfers, inbound orders, and outbound orders. Capture the movement of each item to a different location or store, or items that have been sold, lost, or returned. Our inventory management and control solution will provide complete visibility into your inventory levels. In the clear spider system you can view parts, orders, allocations, location, on hand quantity, shipping details, ownership and more. Clear Spider will highlight any issues there may be with on hand and available quantities. Issues can be viewed for each individual item in your inventory. In addition, you can view the status of your overall inventory. See if items are in stock, ordered on time, and if deliveries have been completed. Inventory shortages are made visible immediately so you can address them as quickly as possible. Clear Spider offers a wide range of options for categorizing your products. You can assign product names, descriptions, groups, and categories. With customization, you can also add additional product reference fields. For example, a company selling sweaters in an assortment of different colors can create reference fields to sort inventory by color, size, or any other filter. Automated re-ordering and order creation is based on minimum and maximum quantities, orders, and consumption. The system will automatically generate purchase orders once you have reached your minimum level. Your stock will always be ordered and shipped on time.